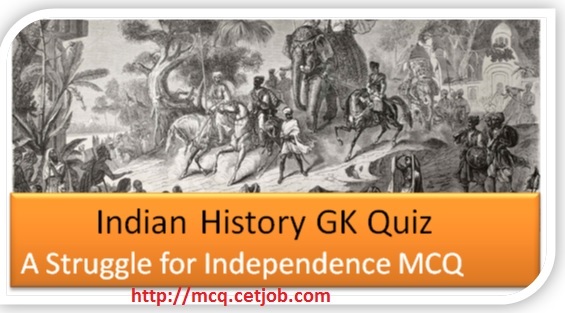 In this section we are going to share some most important Indian History Gk Questions on the basis of A Struggle for Independence of India Quiz. This multiple choice question is very helpful for those candidates who want to prepare for various government; private or PSU exams like UPSC, state PSc, Vyapam, TET, Police recruitment, Grade 1, 2, Bank PO exam, SSC, etc. 1. Who had given the slogan of 'Do or Die' during All India Congress Committee in Bombay and ratified the 'Quit India' resolution? 2. What was the another name of 'Quit India movement'? 3. What was the another name of 'Pledge of Indian Independence'? 4. When was the August Kranti pulled back? 7. When was the 'Quit India Movement' Launched by Mohandas Karamchand Gandhi? 8. Which of the following statements is not correct with reference to the Indian Freedom Struggle? 9. Which of the following leader who presided All India Congress Committee session on 9th August? 10. Which of the following provision was not included in the Nehru Report? 12. When was M.K Gandhi suspend after the violent act of peasants at Police station of Chauri Chaura, near Gorakhpur in UP? 13. When was the Non-Cooperation Movement got momentum under the leadership of Mahatma Gandhi and the Indian National Congress? 15. Which of the following leader given the term ‘insenate waste’ on the the burning of the foreign clothes during the Non-Cooperation Movement? 16. When was the non-cooperation movement started by M.K Gandhi? 17. Which of the following committee and act is associated with the Sedition act? 18. Which of the following event was the reason for the withdrawn of non cooperation movement? 19. Which of the following was the achieved milestone of the Non-Cooperation Movement of 1921? 20. Which of the following event compel M.K Gandhi to withdraw the Nation’s cooperation from the British Government? 21. When was congress split? 22. Who started the English weekly ‘New India’? 23. Who said that the congress is tottering to its fall, and one of my great ambitions, while in India, is to assist it to a peaceful demise? 24. Which of the following leader was not present in the very first meeting of Indian National Congress? 25. Who said that Indian National Congress is a ‘begging institute’? 26. Which of the following statement is not true about the Indian National Congress? B) W.C Bannerjee was the first president of congress. C) It was formed when 72 delegates from all the presidencies and provinces of India met at Bombay. 27. Which of the following is not true about Bal Gangadhar Tilak? 28. Who told that Indian National Congress represents only microscopic minorities? 29. Which of the following is not true about the Muslim League? A) It was established by the Nawab Salimullah. B) It was established in Calcutta in 1906. C) The league supported the partition on Bengal. D) The league opposed the Swadeshi movement. 30. Which of the following leader was not moderate?